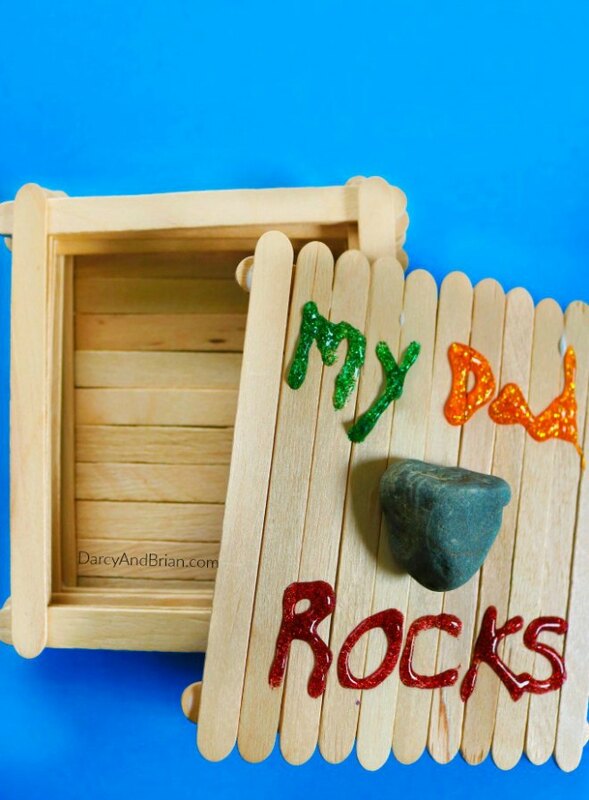 Inside: 12 awesome and easy father’s day crafts for Preschoolers. Handmade gifts make treasured gifts, and with these easy tutorials, the kids will have a ton of fun making something special for dad. Crafts are complete with hand prints, rocks, lots of paint, Lego and even puzzle pieces. This gorgeous gift by “Happy Home Fairy” would be something that preschoolers would be thrilled to be part of. Asking them to stand for a photo for dad and then completing a special father’s day interview would be the perfect present. Place it all on a piece of card, laminate it all and it’s a gift that can be kept forever. Does dad give out the most ginormous hugs?? 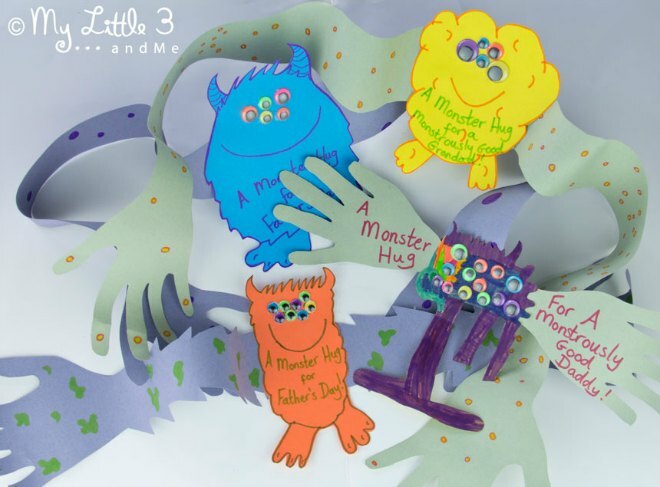 Then making a monster hugs card would be the prefect thing for him. 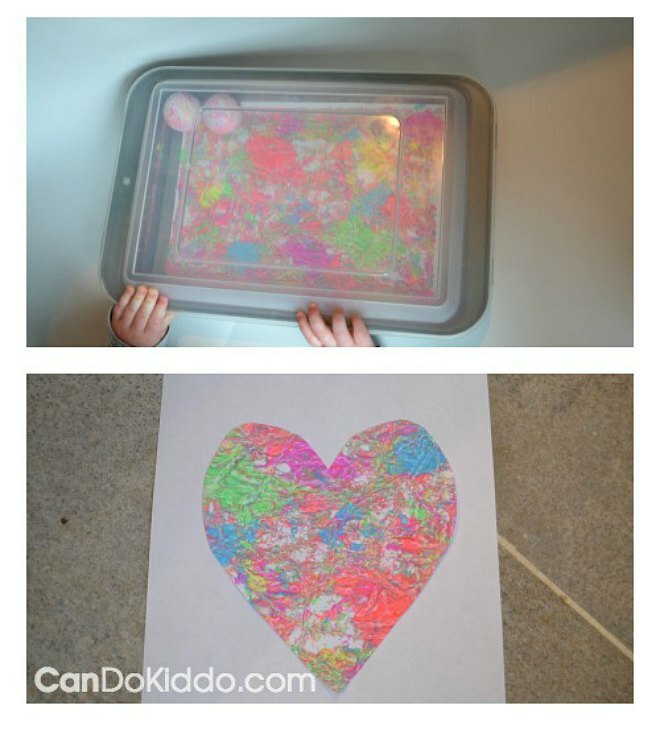 “Kids Craft Room” will show you exactly how to do it. 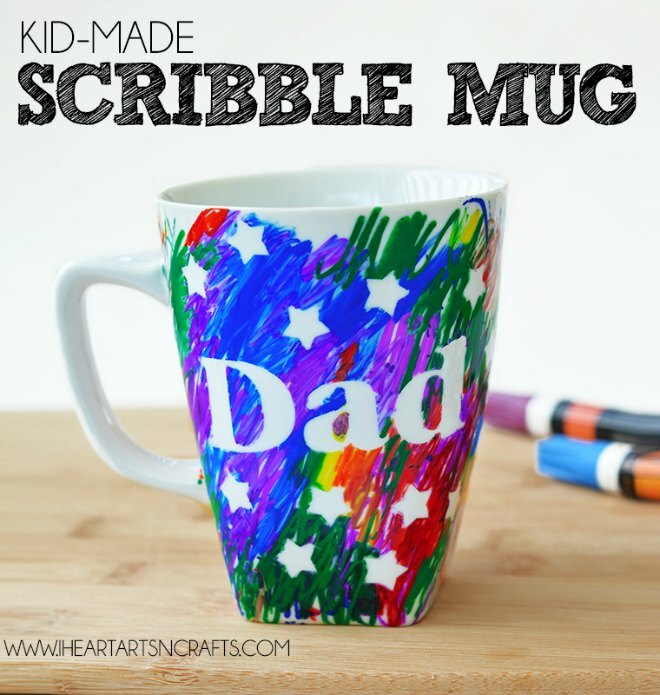 If dad loves his coffee, then an awesome gift would be a special scribble mug made just for him. “Heart Arts n Crafts” show how you can easily make this using a plain white ceramic mug and paint maker pens. 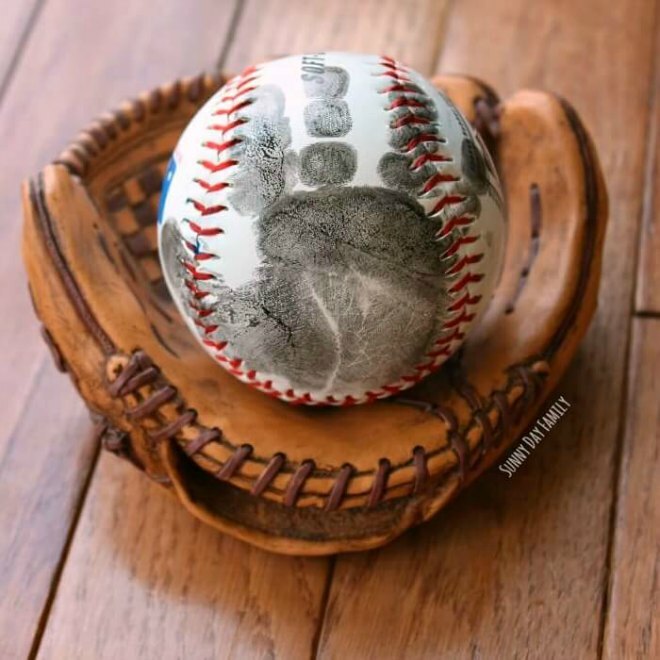 For the dad’s that love their baseball, they would adore this handprint baseball by “Sunny Day Family”. Using just an everyday baseball and an ink pad, you can create the gift that will be treasured. Seriously, anything that has your child’s hand or foot print on is pretty up there when it comes to top gifts. I love this handprint card by “Crafty Morning” and the kids would love getting their hands dirty with the paint in order to make it. Use some non toxic paint to ensure that it is safe for the kids skin. “The Seasoned Mom” shares an easy father’s day gift for preschoolers that they will have a ton of fun with. Not only will their love thinking of ideas to write on the Lego blocks, but little one’s just love filling mason jars. 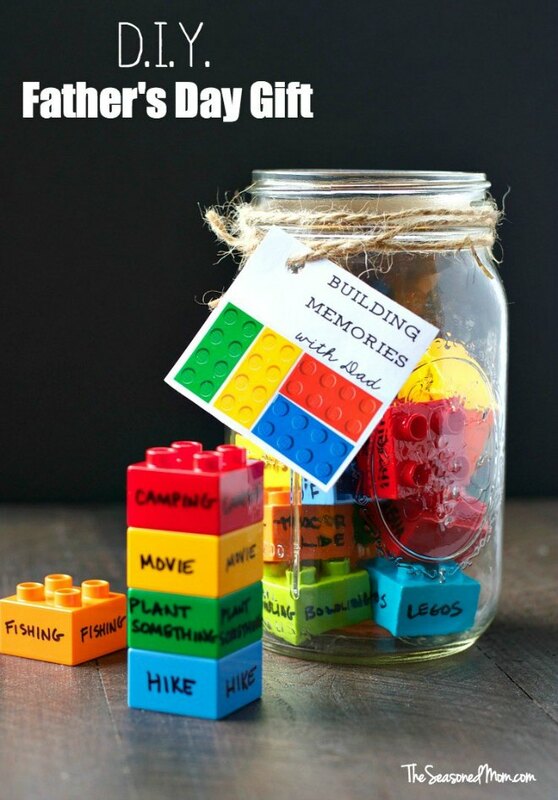 Preparing this building memory jar gift will keep them super occupied and it will also give them a chance to think of all the things that they would like to do with dad. This is a gift that will keep on giving throughout the year. What is it with kids and popsicle sticks. They love playing with them right? Well, now you can put them to good use with this dad rock’s keep sake box by “Darcy and Brian”. 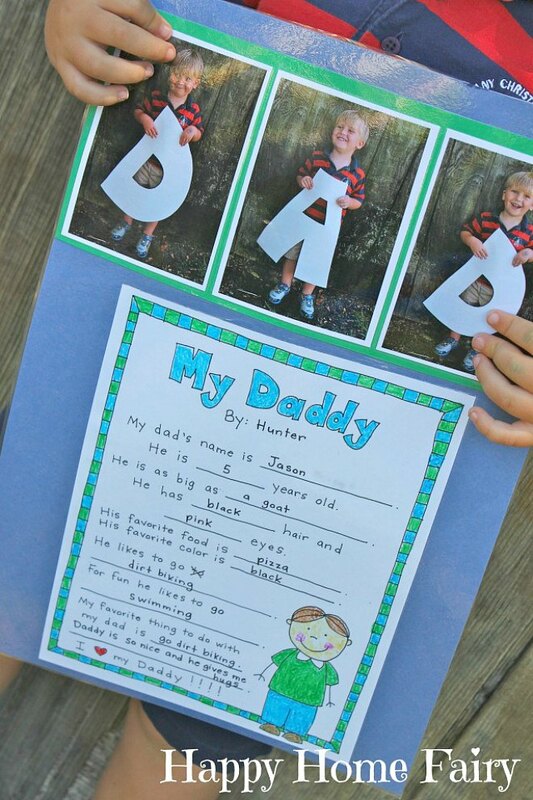 This is one of those father’s day crafts for preschoolers that you really can’t go wrong with. Just grab those popsicle sticks, textures and any other craft supplies of choice, and create a stunning keepsake box for dad. A little hand print complete with an adorable photo. This is the kind of gift that would melt dad’s heart. 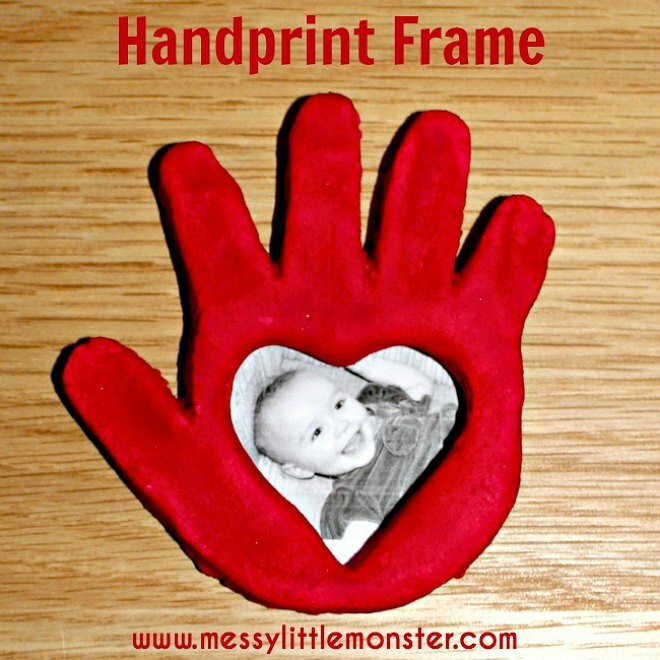 “Messy Little Monster” has an awesome tutorial to follow that will show you exactly how to make the salt dough hand print frame. If your little one loves collecting rocks, then you can finally put one to good use! 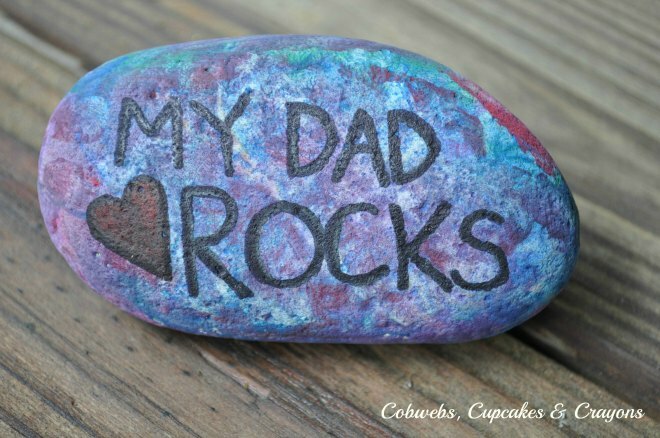 This rockin father’s day gift by “Cobwebs, Cupcakes & Crayons” is a super cute way to give a gift that is made with love. Whether they paint with their hands or a paint brush, they will have a ton of fun. What preschooler do you know that doesn’t like finger painting. They are pretty hard to find right? 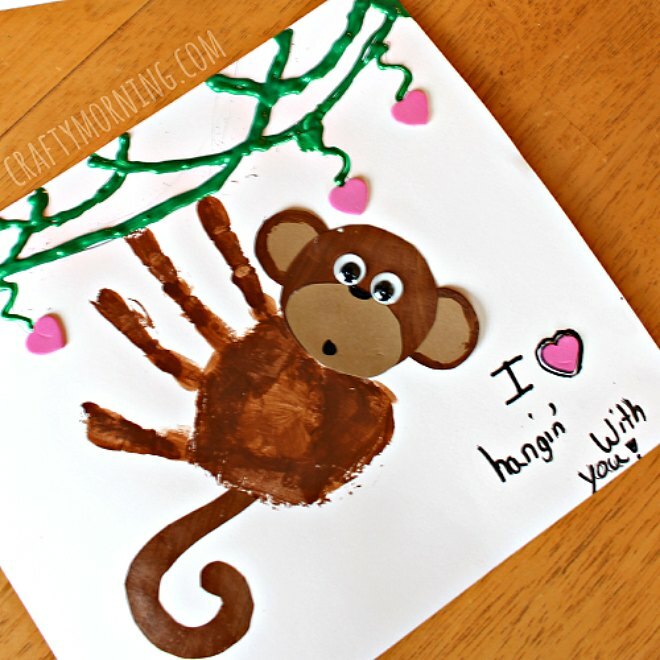 So why not make an adorable finger paint card to go along with dad’s gift. “Clares little Tots” shows you exactly how it’s done. 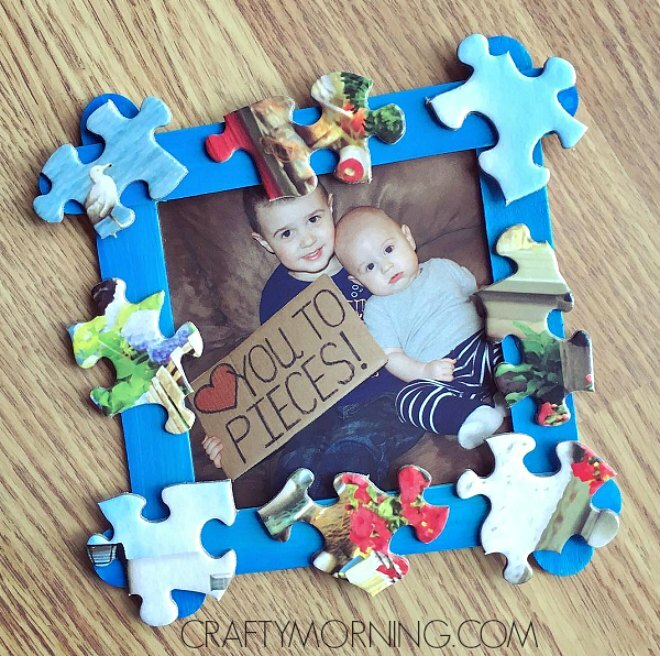 I absolutely adore this puzzle piece frame by “Crafty Morning”. For those of you with puzzles with pieces missing, this is a great use of the puzzle rather than throwing it away. With a super cute picture in the frame, this easy father’s day gift will be an absolute winner. Need an gift from the smallest member of the family? This can be easily achieved with some golf ball painting by “CanDo Kiddo”. It’s super cute, really fun for bubs and would certainly be a keepsake for dad. Surely this is a win win father’s day gift for the babies. With so many easy father’s day gifts to make, it can be difficult to decide. Maybe dad will get spoilt with an array of gifts this year! 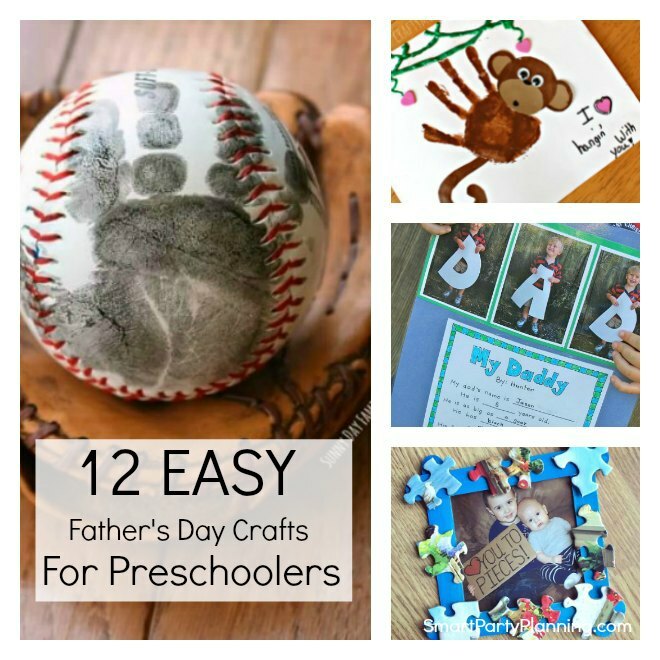 Have you tried making anything with your preschooler for Father’s day before? How did it turn out? I would love for you to share with us below. Let’s stay in touch. 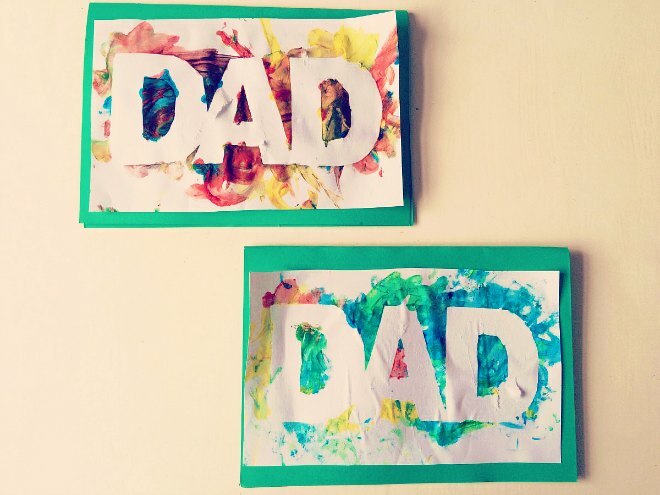 Did you love this selection of father’s day crafts for preschoolers? Sign up to the weekly newsletter so that you never miss out on our easy party, recipe and printable ideas. You will also have access to a ton of free printable’s from the free printable library.